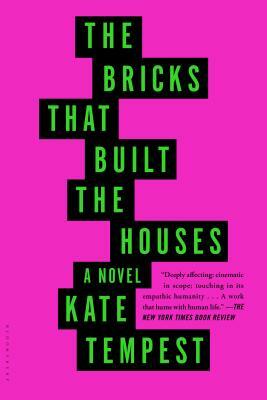 The Bricks that Built the Houses is an unexpected love story. It's about being young, but being part of something old. It's about how we become ourselves, and how we effect our futures. Rich in character and restless in perspective, driven by ethics and empathy, it asks--and seeks to answer--how best to live with and love one another. Kate Tempest grew up in south-east London, where she still lives. Her first poetry collection Everything Speaks in its Own Way was released on her own Zingaro imprint. Her epic poem, Brand New Ancients – a modern-day myth set in south London – won the Ted Hughes Prize in 2013, making her the first-ever recipient under 40. Her extensive international tour of Brand New Ancients sold out everywhere and gained a five star review in the New York Times. Her plays include GlassHouse, Wasted and Hopelessly Devoted. She released an album, Balance, with Sound of Rum in 2011 and her debut solo album, Everybody Down, a narrative-led hip hop record based on The Bricks That Built The Houses, was released on Big Dada records in 2014 to wide critical acclaim. Kate Tempest's second poetry collection, Hold Your Own, will be published in October 2014.